One can travel through this massif simply traversing its enormous glacial plateaux (slightly uninteresting), or climb it numerous very technical 4000m peaks (difficult). We have chosen another option, more open to intermediate level skiers, which is a circuit traverse with the aim of climbing a number of summits that are accessible on skis. Also included are, of course, are some fantastic descents. Price: 1525€pp. Includes: six days ski touring with a qualified UIAGM high mountain guide, seven nights full board hotel and refuge accommodation. 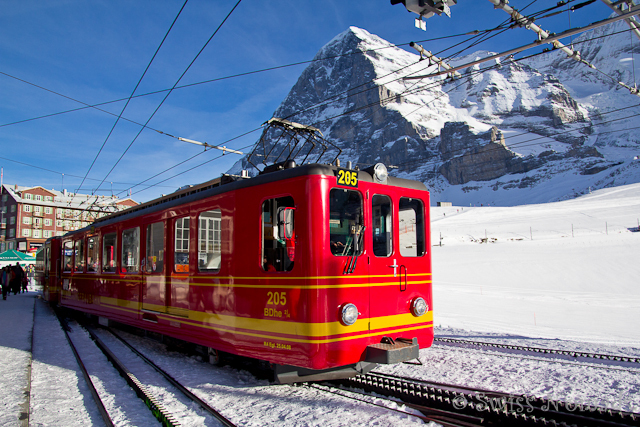 Not included: equipment hire, ski passes, train to Interlaken from Geneva or Zurich. Day 1: We meet either at the train station in Interlaken or directly at the hotel. Meeting with the guide and discussion of the week's plan and weather conditions. Equipment check. Day 2: We take the train to Jungfraujoch at 3500m and ascend the Trubgerg at 3880m via the Monchjoch. This is followed by 1100m of descent to reach the bottom of the ladder leading us to Refuge Kondordia (2850m). Day 3: Our second day sees us summit the Grunhornlucke (3280m) and then descend towards the Fieschergletscher at 2950m. 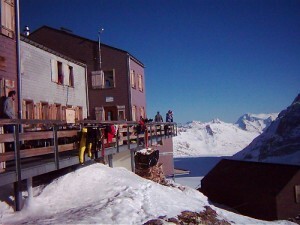 We then climb again to the Finsteraarhorn Refuge (3050m) with the ascent of Wyssnollen (3590m) for the afternoon. Day 4: We head back down to the Fieschergletscher (2850m) to the foot of Grosses Wannenhorn, which we climb (3906m). This is followed by a lovely descent of 1200m and a climb back up to the Oberaarjoch Refuge (3250m). 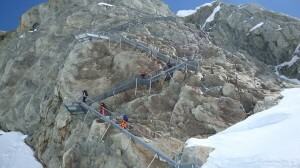 Day 5: Today we ascend the Scheuchzerhorn (3460m) in order to enjoy the fantastic 1300m descent to the Unteraagletscher. 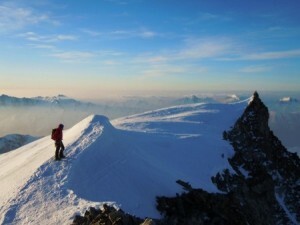 Then a short climb to reach the Lauteraar Refuge (2400m). Day 6: Now we are in the swing of things we have a relatively steep climb to the Hubelhorn (3240m) and another excellent descent (1100m) on the north side into the Gauli Cirque. We spend the night in the Gauli Refuge (2200m). Day 7: Our last day leads us up the summit of the Ränfenhorn (3260m) and finishes near Rosenlaui (1330m), which means an almost 2000m descent. Transfer to Meiringen and then Interlaken, and back to the hotel. Day 8: Head home or onto your next trip from Interlaken train station.